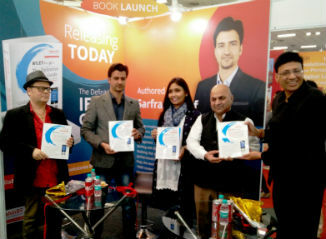 New Delhi,: Wiley, world leader amongst publishers of Education and knowledge books has joined hands with Abhinav, the pioneer in immigration industry in India for the launch of a unique guide book on IELTS recently. Unveiling of the book was done by Mr. Vikas Gupta, Managing Director, Wiley India, Mr. Ajay Sharma, Managing Director, Abhinav, Mr. Sarfraz Yusuf, the author and Mr. Stefan Kaye in the presence of prominent dignitaries and guests. The book has a CD attached to it which has videos with guidance from the experts. During this occasion, Mr. Ajay Sharma, Managing Director, Abhinav of Abhinav.com expressed his views on the importance of this guide. He highlighted that IELTS is one of the key requirements for anyone wanting to immigrate in any part of the world whether as a skilled professionals and even as a businessmen or investor and how a good IELTS score has become mandatory even for admission into majority of world-class universities. Another significant observation he made was that most of the prospective immigrants are away from the testing environment for a long time. Thus, irrespective of how fluent they are in English, it is important for them –before giving IELTS test — to get acquainted with the IELTS testing environment. Wiley-Abhinav guide helps them in doing so in the right way. He stated, very confidently, that in due course this book will be like a ‘Bible’ and benchmark amongst IELTS training guides. The book is specifically targeted at those preparing for the General IELTS test. It is filled with concepts, test taking strategies and practice questions, all hand-picked by in-house experts having long years of experience preparing students for IELTS. The book is divided in sections like Introduction to IELTS; Diagnostic Test; sections on Listening, Reading, Writing and speaking and the Practice Tests.